Open Source application servers aren't "free." 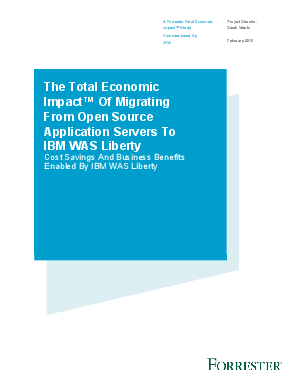 Download the Total Economic Impact of Migrating From Open Source Application Servers to IBM WAS Liberty, a Forrester Consulting Total Economic Impact Study commissioned by IBM to learn how much you can save by migrating away from open source. WebSphere Liberty can deliver 122% ROI, reduce infrastructure costs by $350K and improve developer productivity by 12% over open source application server alternatives.